A friend invites me to a contra dance in Cocoa Beach. A long drive from Gainesville. Is it worth it? Wait a minute…didn't I just read something in a recent issue of National Geographic's Adventure Magazine that there is a stupendous kayaking adventure nearby at Cape Canaveral? I quickly pull out my Delormes Gazetteer. Sure enough, Cocoa Beach is an easy drive from the Cape. And my wife is out of town for the weekend. I'm going dancing and paddling this weekend! A paddle friend of mine agrees to join me for the kayaking, as he lives only a few hours south of there. Packing gear for the trip, I make an unforgettable mental note to myself: "I'm going to spend all day paddling a place called "MOSQUITO Lagoon. TAKE INSECT REPELLENT." Mosquito Lagoon is an estuary located within the Canaveral National Seashore. The estuary is designated as an Outstanding Florida Water by the State of Florida. It is both heavenly for fisherman and a paddler's paradise. We see not a single boat -- motorized or paddle -- for most all of the day within the estuary. Which strikes me as quite odd, since it is clear that the Mosquito Lagoon is a perfect venue for kayakers. Odd not only because of the setting, but on this day, the weather is gorgeous and, despite the name of the lagoon, we experience not a single insect the entire day. Canaveral National Seashore was created by an act of Congress on January 3rd, 1975. The park contains 58,000 acres of barrier island, open lagoon, coastal hammock, pine flatwoods and offshore waters along the east central coast of Florida. It represents an excellent example of a relatively stable barrier beach backed by a productive lagoon system. The park's 24 miles of undeveloped beach is the longest such stretch on the east coast of Florida. Mosquito Lagoon, which comprises over two-thirds of the park, is a part of the 155-mile long Indian River Lagoon (IRL), an Estuary of National Significance. The IRL is considered the most diverse and productive estuary in North America. Mosquito Lagoon supports nationally-recognized commercial and recreational fisheries for finfish, clams, oysters, blue crabs and shrimp. The park provides habitat for 14 federally-listed (Threatened and Endangered) animal species, ranking it second in the entire National Park Service. Three sea turtle species deposit approximately 4000 nests on the beach each year. Large numbers of waterfowl and wading birds utilize the Seashore as a migratory stopover and wintering ground. Located along the "frost line", the park contains a rich and unique mixture of subtropical and temperate plants found nowhere except central Florida. 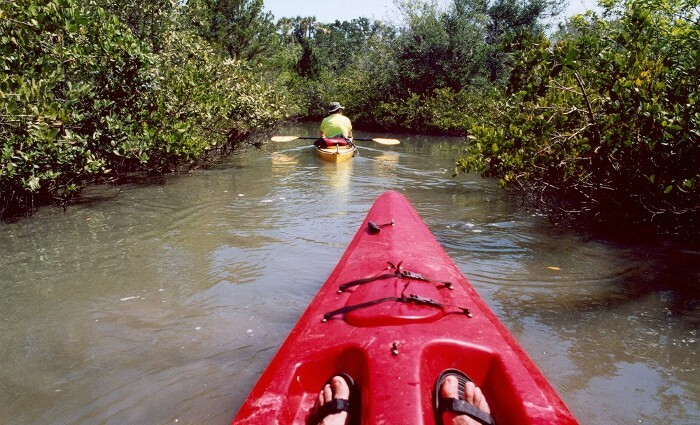 During our paddle, we find the waters to be relatively clear and vibrantly teaming with fish and wading birds. Throughout the day, the water in front of our kayaks would literally boil as large schools of bait fish would frantically scurry from our on-coming boats. We see hundreds of flying mullet leaping about all around us. Enormous numbers of seagulls, heron and osprey. There are thousands of small mangrove islands within the lagoon, and a great many narrow channels carved out long ago in an effort to drain the standing water in order to control mosquito populations. Such a geography creates a fascinating, challenging maze for the paddler. 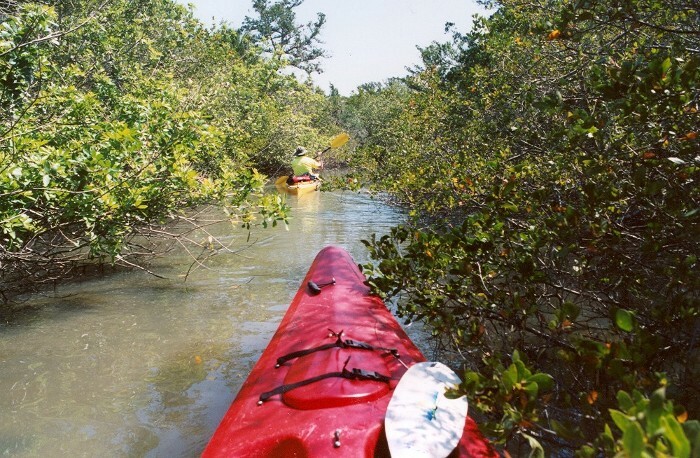 Indeed, we often find, after a long paddle through a narrow, mangrove-encrusted passage-way, that we have reached a dead end and need to back-track out again. Without directional signs, it is as if we are the first humans to ever explore the area, since we have no way of knowing whether a passage we are entering would be a cul-de-sac or not. (we come to realize, over the course of the day, that if the passage shows a current, there is a good chance that there would be an outlet to open water). Mostly, the lagoon waters are quite shallow -- averaging less than a few feet in depth. Fortunately, we paddle during high tide, and only need to portage a few times. There are many patches of oyster beds along the bottom, but they are fairly easy to see in the clear water and fairly easy to avoid. After a few hours of determined paddling, we finally arrive at the Seashore coastline, where an attractive, amber-colored beach with large grains of sand are found. The surf looked quite challenging and playful for the few surfers who braved the surf this day. 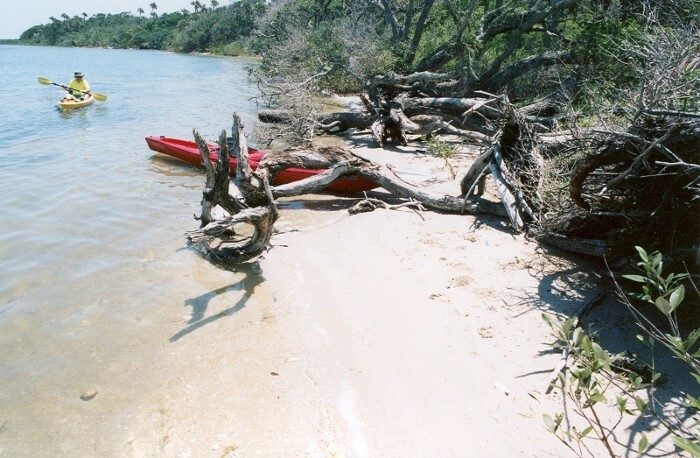 The coastline is approximately 3 miles as the crow flies from the mainland launch point, but the back and forth required to negotiate the thousands of mangrove islands means that the paddle to the coast becomes about 5 miles of paddling. Fortunately, those 5 miles take the paddler through a quite remarkable, pleasant marine setting. The Canaveral coastline is well-known as a turtle-nesting location that draws a number of turtle watchers and helpers during nesting season. Afterward, we visit the National Park Service Information Center, and gather map information. We are told that our put-in point is just a bit north of the large cell tower, so as long as we keep the tower on our left, we'd be okay, direction-wise. What we don't count on is the fact that there are TWO towers on the mainland, and we guess wrong as to which is ours. The result is that we emerge from the Lagoon onto the menacing Intracoastal Waterway (which hugs the mainland) a number of miles north of the classy Riverbreeze County Park boat launch take-out point. No wonder navigational skills and devices are so important to the mariner.